A 1948 German documentary on Ceylon includes traditional drumming in the soundtrack. Sri Lanka has one of greatest drum cultures in the world said Ravi Bandu, the respected drum artiste. 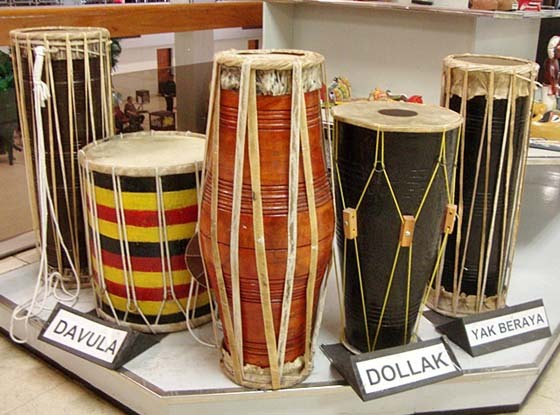 ‘The most important area of Sinhala music is found in its drum play. Our drum rhythms are unique and we have our own style of drumming’, said musicologist C de S Kulatilleke. The drums address each other and take up each other’s rhythms, said M. H. Goonetilleke. There are hundreds of complex rhythmic patterns. The magul bera performed on all three drums at an inaugural occasion is a beautiful example of the expressiveness of Sinhala drum music. Drums are used in all rituals, for gods (madu) demons (tovil) and planets (bali). Lawrie’s Gazetteer of 1896 noted that only a handful of the devales he looked at had dancers but they all had drummers. Drums are an integral part of ritual dance too. The vigor of the dancing is matched as well as balanced and controlled by the drumming. Nearly all drum patterns are named after the dance sequence they are used for. The drum tradition remained firmly entrenched in the island during British rule. The British administration initially recognized drumming and allowed it. The Colonial Secretary ordered that the announcement of the first National Census scheduled for 26.3.1871 be made by drum in the provinces. Pani Bharatha (1920-2005) recalled that when he was growing up, there were open drumming displays and contests in the villages at temples and Walauwas. "These contests helped to develop our skills". In 1928, Radio Ceylon opened its broadcast with a magul bera recording. In 1934, the documentary film Song of Ceylon featured Kandyan drumming. A 1948 German documentary on Ceylon starts with drumming. Up to the 1960s, auction houses advertised their auction sales using drummers beating the daula. However, the Christian missionaries wanted the British administration to ban drumming at temples, in processions and at ‘demon rituals.’ The British administration banned drumming in processions. There was strong resistance to this ban. The 1915 Sinhala –Muslims riots were due to a refusal to stop drumming when a Buddhist procession went past a Mosque. Bhikkhus were taken to courts as late as 1930s with regard to this ban. Temple drumming was not affected by this ban. Drums continued to announce the various activities of the temple. There were different drum beats for different things, including one for the priests to hurry up for a pirit ceremony as it was getting late. When two sets of drum teams are playing and the second drum team is not to be seen, the first team plays a tune to summon them, ‘Come’ and the second team replies, ‘Yes we are ready’. In the Dalada Maligawa tevava, there are different drum beats for the different offerings made during the tevava. There is a special drum beat when the casket is placed on the elephant at the Esala perahera. There were about 35 drums in the olden days, now there are only ten, said Piyasara Silpadhipathy. The patawa bera is no longer available but Pani Bharatha had one in his drum collection. According to P. Dolpahilla the following drums were in use in the 1950s. Two types of daula, geta bera, yak bere, three tammattam, bummadiya, and a small two faced drum much like the ana bere used for government notifications. Dalada Maligawa had a four feet long drum which resembled an udekki. It was used on perahera days to call the elephants to the temples from Getambe, Katugastota and Lewelle where they awaited the signal. The four main drums, geta beraya, Ruhunu bera, davula and tammattama, have different playing techniques and highly codified teaching methods. Instructions on drumming are given in verse form. One verse said ‘tis ekaka talam, susata paman savudam, visiek suralin, gasu solosak vandamanam,’ quoted M.H.Goonetilleke. The manuscript ‘Davul upata’ gives the 216 rhythms of the davula in verse. The traditional techniques, visible at present in a few fragmentary documents of the 18th century, have disappeared due to lack of usage. Contemporary drummers have instead, developed rich, new styles of their own, said C. de Silva Kulatillake. Ravibandu says the drum orchestra, which is so popular today, was created in the 1940s by Pani Bharatha. Each drum was given a beat that suited it for its solo. The performance started with the hewisi beat for aluyam duraya. The next generation of drummers, notably Piyasara and Ravibandu carried the venture further and created magnificent mixed drum presentations, with new drum beats and the two new drums, created by them. These presentations were rich in technique, inventiveness and impact. Drums which were till then limited to rituals, perahera, and pinkam were now presented on stage in cleverly arranged drum ensembles. There are solo performers on drums as well. Jananath Warakagoda, whose ‘marvelous drum beats’ are much admired, said ‘from the very first lesson I fell in love with the four amazing drums, geta, yak, daula and tammattama. Nowhere in the world can you find anything similar to these four drums.’ His favourite is the tammatama. Susantha and Prasantha Rupathilaka, good looking with chiseled feature, are exceptionally talented in drums as well as dance. They have performed all over the world. They gave a superb performance in Colombo in 2009. Mahanamage Jayantha Melegama of Wadduwa, a drummer, who performs at tourist hotels in the south, has been invited with his troupe to tour England by the director of a Sri Lanka cultural foundation. Rural and urban schools are now interested to drumming, observed Ravi Bandu. Most leading schools have drum troupes. Bishop’s College, Colombo hewisi band started in the 1960s. Trinity College, Kandy drum and dance troupe, which started in 1972, participated in international festivals in UK and Sweden in 1992 and 1998 respectively and won awards. The Hewisi bands of St. Thomas, Trinity, Bishops and Methodist College, Colombo gave a combined concert in January 2015 in Colombo. The Maligawa has a permanent Hewisi performance group, consisting of drummers from Molagoda, Malagammana, Ihalawela and Uduwela. Drawings of the senior, now aging drummers of these families were published, as a gesture of appreciation, by the Maligawa, in The Ceylon Daily News of 26.7.2012 p. 23. The Malagammana drummers came from Ihala dolos pattuwa in Kurunegala, Molagoda drummers from Pahala dolos pattuwa in Kurunegala, Ihalawela from Dumbara and Uduwela from Matale. They held nindagam lands. The pannikiya duraya was handed down from father to son or brother to brother and never went out of the designated families. Each day four people drawn from the Pannikki clans played for the tevava, on the daula, tammattama, geta bera and horanava. Three Sunday newspapers ran interviews with several Maligawa drummers including the late Berakara gedera Molagoda, his brother Silva and P. Malagammana. Molagoda had performed the hewisi puja for more than forty years. He had learnt to drum from father and grandfather. The family was also closely associated with the village temple, Molagoda Raja Maha Vihara. Molagoda and his younger brother Silva had followed the father into the Maligawa. They were part of the temple hewisi team and had participated in the perahera. They also performed at other peraheras such as Hanguranketa, Gadaladeniya, Embekke and Alawatugoda. The drummers complained that they were finding it difficult financially. Their nindagam had been divided and subdivided over the generations and did not yield sufficient income. The travelling cost more than what they were given by the Maligawa. Malagammana said his two sons were not going to take over from him. They have taken other jobs. Soon there will be no body to take over from them at the Maligawa . The drummers deeply resented society’s attitude towards them. They were looked down as low caste in their village. ‘We are treated badly. They use us, and then discard us’ they said. ‘We get insulting looks when we carry the bere. When we are summoned for functions nobody would tolerate us in their houses. Even if they had the space they would construct a small hut for us so that we did not have to stay with them.’ Molagoda had once been offered tea in kolapotha, a cup made of leaves. Several dancers and drummers, who were invited to a function at a ‘posh house’ in Kandy, were given a corner to stay in, worn pieces of mats to sleep on and nothing to eat. Silva also recalled that they were not permitted to study beyond a certain grade in school. The principal told us that members of my family must study in the temple, that we belong to the temple. Silva said he felt very hurt over this. Molagoda said his son also had resented the way they were treated. ‘Since society did not accept or respect us, I turned to carpentry’, he said. Today however things have changed, Silva said. Caste consciousness may exist at village level, but it is now fashionable to be involved in the arts. Talented persons like the late Molagoda and his son Rohana are beginning to be treated as national treasures. Molagoda was awarded the Kala Vibhushana title. Pathmasiri, one of Silva's four sons, is sorry that he stopped dancing but his son Dushmantha, studying at Rahula Vidyalaya, Katugastota, is a talented and fully qualified dancer. He is the only one of Silva’s grandchildren to take to dancing. ‘I realize that there is now great potential for artistes like us. There are also the earnings from tourist performances. In addition to this, the Diyawadane Nilame has ensured that the drummers receive better payment and allowances.’ Malagammana’s grandson Sagara has also taken to drumming. Ehela and kohomba are now prohibited and only coconut, jak and palmyrah can be used. Monkey and iguana skins are prohibited, the skins of cattle and goat are used. Rohana Wijesinghe of Alawala village, Attanagalla, a long standing drum manufacturer, learned the art from his father who learnt it from his father, Napin Singho, a leading drum manufacturer in the 1940s.